I got the wonderful George Foreman grill with the changeable plates for Christmas a few years ago. I have since been struggling with how to store the 5 grill plates since they don’t stack conveniently and can get easily scratched. I live in an apartment, so storage space is hard to come by. After several disappointing online searches, I decided to create my own [storage solution]. 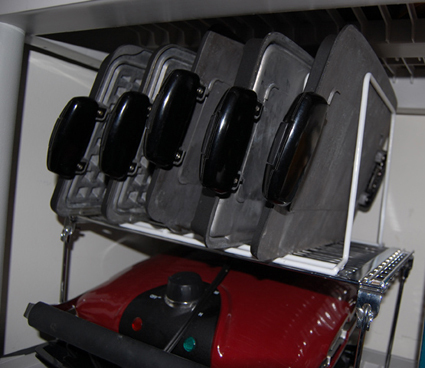 I used a vertical, metal sorter (similar to this one) placed on top of a locker shelf (similar to this one) so I can store my Foreman grill underneath the plates. The file sorter that is holding the grill plates is coated in plastic so it won’t scratch the plates, which is vital! In addition to being a great solution for a George Foreman Grill, it would be wonderful for waffle iron plates, lids for reusable storage containers, lids for pots and pans, and even baking pans and cookie sheets. Thank you for such a terrific suggestion, Liz! That IS a good idea. Those things can be so bulky. And how perfect that the shelving won’t scratch the plates! Oh what great timing! I have bought a similar device a few days ago (not a George Foreman but very much alike, with the different plates) and wondered about proper storage. This looks great, exactly what I need! This is how I store sheet pans, cupcake pans, cooling racks, griddles, serving platters–all my big and somewhat flat kitchen stuff that can stand on it’s end. For the serving platters, I put strips of foam to rest them on so they won’t chip. Great idea! I too store my baking pans this way although I use a divider made by the Container Store that I believe is used for this purpose. But if you can do it yourself for cheaper, I think that’s great – wish I had thought of it! Wait, what? I can’t take the plates off *my* George Foreman! Curses! What I wouldn’t give to be able to clean the accursed thing properly. I might even use it more than 3 times a year! That’s a great idea. I use something similar for cookie and pizza pans and my cooling racks and keep them under my JennAir cooktop (oven is in a different location). With the exhaust pipe under the cooktop, the space wasn’t being used well. About cleaning those non-removable George Foreman grill plates: while the grill is still a little bit warm, wet some paper towels and lay them across the plates, pushing them into the slots. Go and watch the news. After a half hour or so, you can use the same paper towels to wipe the grill clean with no effort.